The Globe and Mail has an interesting story about a recent conference held in Boston that put a number of new "wearable computing" devices on display. Everything from shirts that nag you to straighten up, shoes and name tags that track your movements, and gloves that control your music player volume. The thing that I find incredible about these devices is that now, like never before, they are very close to having commercial applications and acceptance. Expect to see or hear more of this technology soon! Cleaning your flash drive, don't try this at home! I'm in the habit of removing things from my pockets when I get home at the end of the day. After Taekwondo class last evening I began the ritual, but something was missing. 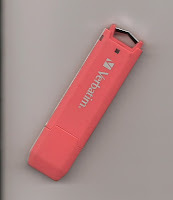 Flash drive - Flash drive? No Flash drive! Retrace steps... Check office, no Flash drive. Check night table, nope. Check work clothes... where's my work clothes? Check hamper, no work clothes. Check washing machine... Flash Drive! I don't recommend that you throw your flash drive in the washer! But if you do, let it dry 24 hours or so before inserting into your usb port and if you're lucky, like I was, it will still be shiny, clean, and functioning! I have a feeling the cell phone might not have been so lucky. Amazing YouTube video - wow! While this is not that geeky, other than it's a YouTube video... I just had to pass it on. Now that's talent! Viral marketing ploy, build audience and then create the tv show! Hopeful producers of horror/sci-fi television series Alive chose to produce three short viral videos to promote their show rather than produce a costly pilot. The videos were put together in 2 days and, frankly, it shows! Then again, it's not necessarily my taste in television, but it will be interesting to see if the ploy works. According to this Wired article, the shorts have generated buzz amongst the whet genre fans, but will it be enough to convince the network execs? The Globe and Mail is reporting that the Hollywood insider/gossip website PerezHilton.com is being sued by Britney Spears Label Zomba for leaking 10 tracks from Spears' yet to be released new album. The law suit seeks real and punitive damages as well as court costs, this is a music related lawsuit that most would agree makes some sence, as opposed to the many file sharing suits brought on by the RIAA. Here's an interesting find from PCWorld blogs... according to this post, Google Earth now has a YouTube layer that ties videos that have been tagged with geographic information to Google Earth destinations. Not all YouTube videos will be displayed, just those with the geographic tags, but it adds up to a totally new way to explore the earth and waste a bunch of time. Another amazing mashup from our friends at Google! Here's an interesting quote from the recent SCOTTEVEST Newsletter... "I am proud to report that Steve Wozniak, co-founder of Apple, Inc. joined our Board of Advisors. Woz has been a customer for years, and he was the inspiration behind our iPod Spoof, available for viewing here at YouTube. Woz is in good company on our board, which also includes Hap Klopp, founder of The North Face." I'm sure this can only mean more great products from SCOTTEVEST! Nissan's Pivo 2 concept car...cool! Here's a little car that can get you out of, and / or into, tight spots! Nissan will be displaying the Pivo 2 concept car at the 2007 Tokyo auto show, an electronic 2 seater that's passenger compartment can revolve to face forward or back with 4 wheels that can turn 90 degrees allowing the car can parallel park by sliding sideways into a spot. The control console includes what Nissan calls a "Robotic Agent." You can talk to the agent about how the car is running and it can tell you where to locate the nearest parking spot. No specs on range or speed yet! Now that's a Smart Car! See c|net's news.com for more, link above. Coffee lovers? I really didn't expect that one... perhaps there still is room in the social networking space! A post on their blog says Google has bought Jaiku, the Twitter like social networking mini service. In a Q&A page on the site Jaiku says "Jaiku is joining Google. While it's too soon to comment on specific plans, we look forward to working with our new friends at Google over the coming months to expand in ways we hope you'll find interesting and useful. Our engineers are excited to be working together and enthusiastic developers lead to great innovation. We look forward to accomplishing great things together." I'm also greatbiggeek on Jaiku, if you are looking for an invite leave a comment to this post. OnStar to put brakes on stolen vehicles... not really, but nearly! In fact the brakes aren't involved at all but it makes for a good title. Engadget is reporting that OnStar is adding a new feature in 2009 that will pinpoint a vehicle via GPS when the owner reports it stolen, and then when the police have it in sight OnStar "interacts with the powertrain to reduce engine power, which will [in turn] slow the vehicle down gradually." Seems like a safer option than jamming on the brakes and launching the thief through the windshield, but then again that might be a better deterrent! TechCrunch has posted a link to this Google AdSense Blog post announcing video units. "We're excited about the launch of video units -- a new way to enrich your site with quality, relevant video content in an embedded, customizable player." The promise is to match site content with relevant video or allow site owners to choose video categories to be served up. It's interesting, we may give it a try here at Great Big Geek... I'm a little hesitant though as I'm not always happy with the ad content that is matched to my site content. According to Lev Grossman at Time Magazine's Nerd World blog, there will be a Futurama movie released on DVD in time for the holidays! Check out the trailer... then Buy it!, Buy it!, Buy it! With 1200 restaurants in the United Kingdom, McDonald's is poised to become the largest provider of free wireless Internet access in the country. The company is preparing to roll out free WiFi in all of it's outlets as an attempt to draw in the business crowd and better serve it's current youthful clientèle. WiFi, a more muted colour scheme, designer furnishings, and a healthier menu are all part of the strategy to compete with the likes of Starbucks and shift the brand into a higher-end market. As long as they don't brand it as WiFry or McConnected... it might just work. c|net's news.com has more. Here's a preview of Sims 2: Castaway from the folks at G4's The Feed. If you enjoy The Sims series and are a reality TV fan, this might be the game for you! No XBox version though...sigh! Wilson!!! The Canadian Radio-television and Telecommunications Commission (CRTC) regulates the telephone, cable, and Internet companies in Canada, and until now your current ISP had to wait 90 days to try to woe you back when they received your notice that you were changing providers. The rule, which ended on Friday, was put in place to protect small ISP's and resellers from the likes of Rogers and Bell who obviously have more resources to throw around. All bets are off now, so expect the phones to start ringing and the begging to begin! Thanks CRTC.